Fresh from the frenzy and fire that garnered their debut album an ARIA nomination for Best Urban Release in 2008, Spit Syndicate return with their sophomore effort; the much anticipated second chapter in one of Australia’s most promising hip hop fables. With stints on the Obese Records Block Party, Kiss My Grass and Good Vibrations Festival along with sold out national tours with Horrorshow under their belts, the Sydney-based duo take the next step with Exile, cementing their genre-crossing brand of hip hop that transcends through the electro/indie borders. 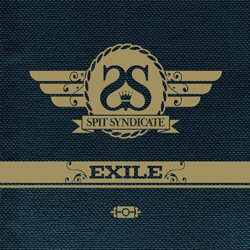 Working with producer Adit and touring DJ Joyride, Spit Syndicate take their Towards The Light experience to bring a heightened and more accomplished approach to Exile. Fostering their love of music outside of hip hop and infusing it with style, flair and their impeccable connection with pop culture, there is no territory left uncovered. For Spit Syndicate, their hard work and talent come hand in hand with having a good time, living the moment, and doing it one day, at a time, all the time. They’ve shared the stage with some of the country’s best, now Nick Lupi and Jimmy Nice step out from the shadows and into the light.